Getting support for your mental health is now as easy as opening up Facebook Messenger. By just opening up the Messenger app, you can connect to Woebot, a new chatbot developed at Stanford trained in administering cognitive behavioral therapy (CBT). The bot — developed by Dr. Alison Darcy of Stanford's Department of Psychiatry and Behavioral Sciences — was developed with college and graduate school students dealing with mental health and wellness issues. But it also employs strategies that work for people of diverse ages and backgrounds. In choosing to launch Woebot on Facebook Messenger, Darcy followed the rule of meeting her patients where they were at. She wanted to provide this service on a platform that people already frequent to make Woebot as easily accessible as possible. Woebot is a yellow and blue bot with a sense of humor and a penchant for emojis. He is modeled after Kermit the Frog because Woebot —like the Sesame Street regular — is clearly a chatbot, but is also compellingly personable and remarkably empathetic. When users interact with Woebot, it doesn't feel like they are talking to a robot with automated responses. Instead, Woebot is meant to feel like an understanding and nonjudgmental — albeit inhuman — support system. That's the magic of this AI creation. Available 24/7, users can talk to Woebot on Facebook Messenger whenever they need to. Woebot works by sending Facebook messages back and forth with users. Users often communicate by selecting one of Woebot's pre-written answer buttons as shown below or by typing out messages. My own conversation with Woebot. One concern of users is privacy. Facebook is known for utilizing your data to provide you with relevant ads and to better your user experience. People don't want their interactions with Woebot displayed to their Facebook friends or made public in any way. Fortunately, Dr. Darcy has assured users that everything they say to Woebot over Messenger is kept completely private. All conversations are anonymized from profiles to ensure interactions are handled with the utmost confidentiality and users can feel comfortable speaking candidly to Woebot. Unlike many other existing mental health apps and chatbots like Joy, Woebot is backed by empirical findings. Dr. Darcy conducted a study in which she recruited college students to engage with Woebot for 20 sessions. She found that after just two weeks of interacting with Woebot, students were significantly less depressed and anxious than before they started. These encouraging results have assured the Woebot team that the chatbot is an effective means of delivering CBT. Woebot is free for the first two weeks of use. After this point, it costs $39 per month. 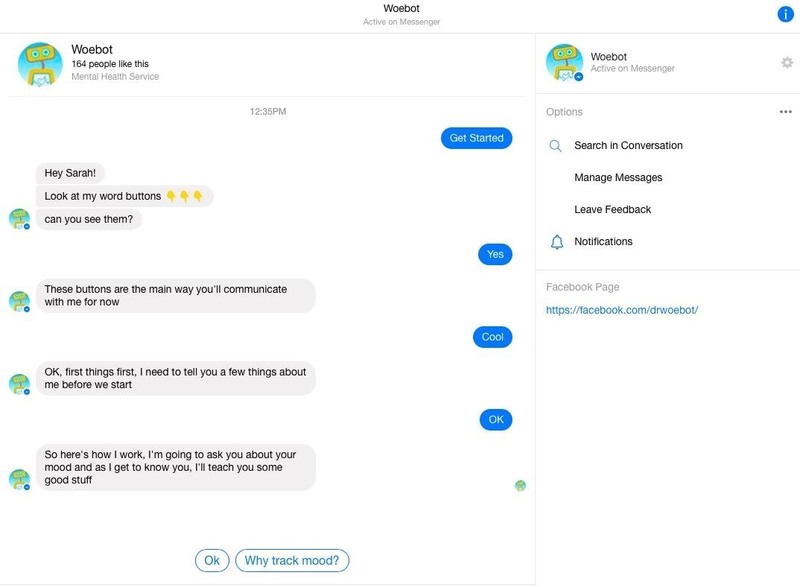 While it is conveniently accessible through Facebook Messenger, Woebot's website has hinted at developing its own messaging platform in the future for those who don't use Messenger. As more options for digital therapy like Woebot arise, consumers can look forward to increased support for mental health issues. Accessible care and affordable treatment in the form of online resources will surely help those who need it.